This is the final novel in the Foundation Universe chronologically speaking. 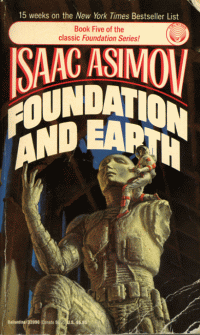 There are a couple short stories completed by other authors, but Foundation and Earth describes (in 494 pages) where Asimov saw his epic saga moving toward. It is a shame that he couldn’t have lived longer to continue on writing. For those that don’t know, Isaac Asimov contracted HIV from a blood transfusion during a heart operation in 1983. It later developed into AIDS, causing heart and kidney failure which led to his death in 1992. For more information on his life and death, visit Asimov Online. I wish I could remember the source, but I know I read that Asimov was not sure exactly how he would continue the series when a fan suggested he go back and write some prequels. Before his death he did fill in some gaps with the Prelude to Foundation and Forward the Foundation. Almost no time has passed since Golan Trevize made his decision in favor of Galaxia over a Second Galactic Empire controlled by either the First or Second Foundation. Trevize is still on Gaia along with Janov Pelorat and Bliss. Golan intends to find Earth so that he can find out why he chose felt that Galaxia was best for not only mankind, but for every living thing in the Galaxy. He will not rest until he finds Earth. Bliss insists on going on his search to act as protection through her role as part of Gaia, and Janov has his own research on Earth that he wishes to complete. The one thing that Asimov succeeds accomplishing in this novel, as he does with the others books in this series, is creating and describing different cultures. These cultures vary from the extremes of conservatism to tribal utopias. Each new world has its own customs, mythology, and history which is described through the interactions between the protagonists and the natives encountered throughout their complex journey. Shortly after it is agreed that all three must go together, they all depart in a gravatic ship, the Far Star. This journey hits plenty of snags along the way. Bliss maintains a connection to Gaia through hyperspace, but this effort drains her and she can only call upon the support of Gaia in extreme emergencies. Golan’s cautious nature, which at times can be somewhat annoying and repetitive, manages to save the group as much as when Bliss uses her Gaian powers. Janov acts as the guide, in that he can piece together the clues to find Earth from that various myths and legends he has been studying throughout his career as a mythologist. As with most of the Foundation Novels, a large chunk of the content is primarily dialogue between the main characters. Asimov makes a point to speak through the characters, and in most cases he succeeds in getting his point across. Golan, Janov, and Bliss make a nice little group, but some of the conversations that go back and forth over the course of almost 500 paperback pages get a bit redundant at times. First, there is the constant reminder that Bliss/Gaia cannot possibly tamper with Golan Trevize’s mind, because that would negate the decision he made. Gaia insists that if Trevize ever changes his mind about Galaxia, that they will support his decision and not interfere with the Second Galactic Empire. Still, Golan constantly asks Bliss if she is tampering with his mind, and she denies it. She does tamper with his mind though, but with words rather than her mental powers. Second is the constant argument over which is better to live as, Isolates (those not part of Gaia) or Gaians. After each encounter that shows the advantages of individualism or disadvantage of participation in Gaia, Golan gloats to Bliss. She also takes every opportunity to point out why Gaia is superior, especially in instances she is able to call upon the power of Gaia to save them from whatever sort of trouble they managed to get into. The third and most annoying repetitive conversation is when Golan knows that he should just trust the computer on the Far Star to make a calculation for a Jump, but decides to just “wait a few days more” just to be sure. They still need to travel away from the major sources of gravity to make a Jump, but the new advances in computing make calculating that jump an order of magnitude faster than before. The conversation has 3 steps: First Golan sits looking disturbed, Janov asks what is wrong, then Golan explains that he wants to put off the Jump because he doesn’t want to make (insert decision here) yet. A subtle plot line revolves around one of the reasons behind Golan’s doubts about his decision in favor of Galaxia. To Golan, for his decision to be correct there must be some type of flaw in psychohistory. The two variables which must be true for psychohistory to work are: 1) The population must be sufficiently large as to make statistical treatment valid; and 2) The population must not be aware of psychohistory. Janov convinces Golan that the First Foundation only knows the bare minimum of the workings of psychohistory, not enough to throw it off. Golan is still disturbed, because if there is no flaw in psychohistory, why did he choose Galaxia? Only the answer to this question and the search for Earth can satisfy him. Among the other Foundation Novels, this is by far my least favorite volume. The one saving grace is the last 200 pages or so, because Asimov really picks up the pace and makes a nice end to the series. He asks quite a few thought provoking questions about what our place is in the vast expanse of the Universe. I’ll leave that vision out of my review, because it is a rather large spoiler. All I can say is that it would have been very interesting to see how Asimov would have continued the series had he lived a while longer.